We are currently working on a long-term project to improve the state of Stockghyll Park. We carried out an initial survey in 2017 and produced a report on the current condition. 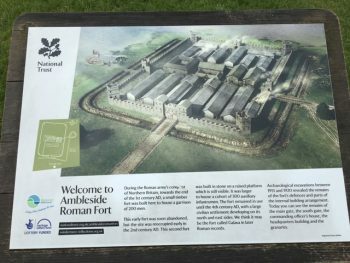 We have recently received a grant of £1965 from the Lake District Community Fund to carry out a public outreach, exhibition and media project about the park. We will also be seeking external funds for a professional survey. Our ultimate aim is to see implemented a full management plan for the long-term upkeep of the park. In 2017 members of the Trust carried out an environmental survey of the conservation area of Ambleside, including the state of roads, pavements and buildings, noting the many positive as well as negative features. Results were presented at the 2017 AGM. We have now set up a small working group of committee members who are engaging individuals and groups within Ambleside as well as local authorities in order to foster a partnership approach to implement actions. In summer 2017 we carried out a census over two days of the pedestrian and vehicular traffic in Stockghyll Lane by the entrance to Stockghyll Park. The purpose was to collect data that could be useful in informing issues related to future development projects in this area and to learn how much use is currently made of Stockghyll Woods. A copy of the report can be read here can be found in the appendix to the Stockghyll Park report (see above). In early 2017 we also carried out a survey of plaques in Ambleside. You can view a PDF page here which includes a link to a Google map pinpointing the location and showing a photograph of each one. We followed this with a widely advertised request for suggestions of ideas for further plaques on which members voted at the 2017 AGM. We are now seeking funding and necessary permissions to implement a number of those most strongly supported. 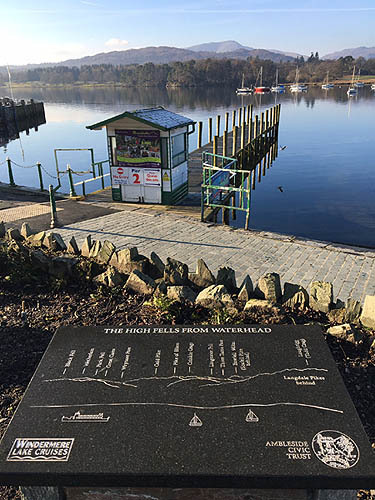 The Civic Trust are also proud to have contributed to the installation of a new panorama at Waterhead (picture left).